StreetlightSim is a research project at the Pervasive Systems Centre, University of Southampton which is developed specifically to evaluate Autonomous and Adaptive Street Lighting Schemes based on Road Users' presence detection over wireless sensor networks (WSN). StreetlightSim has been used to evaluate the performance of various street lighting schemes based on an actual streetlight network in terms of their energy efficiency and utility (a performance metric to measure the usefulness of street lighting to road users) as shown in the Figure 1 and 2, respectively. 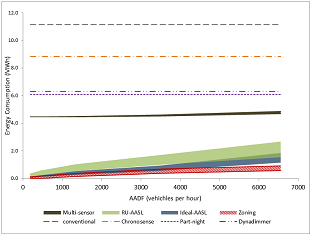 Figure 1: A comparison of energy consumption of various street lighting schemes against different AADF values. 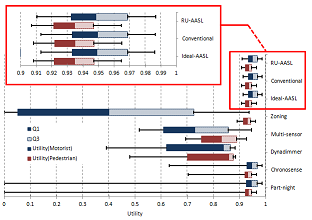 Figure 2: A comparison of streetlight utility of various street lighting schemes according to motorist and pedestrian perspective. We would appreciate a citation of the following paper if you use StreetlightSim or any of its components. You can find out more information on our research, and our use of StreetlightSim as a tool for evaluating novel intelligent street lighting schemes, by reading our publications. An open source streetlight simulation environment based on the well-known OMNeT++ and SUMO. A customisable road traffic pattern which is described by the road traffic distribution according to different times of day and annual average daily traffic flow (AADF). Ease of extension to different streetlight networks using OpenStreetMap and JOSM. Figure 3: Real-time coupling between OMNeT++ (left) and SUMO (right). We extended the real-time coupling between OMNeT++ and SUMO from Veins. As illustrated in the figure below, the main building blocks of this simulation environment are built within the OMNeT++ modules and SUMO is a traffic mobility trace generator according to a specified road traffic pattern. The road traffic definitions describe the road traffic distribution according to different times of day and annual average daily traffic flow (AADF). Whereas the road traffic routes define the specific path a road user should travel during the simulation. Together, both of them define the specific road traffic pattern, which later used by SUMO to generate real-time mobility traces. Once the mobility traces are translated into the OMNeT++ environment, the performance of the street lighting schemes is evaluated according to their energy consumption and streetlight utility experienced by the road users. Both of these metrics are implemented as one of the OMNeT++ modules in this simulation environment. 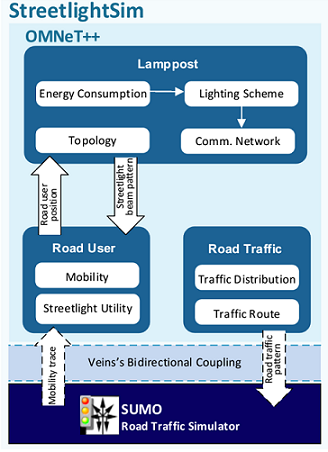 Figure 4: Block diagram of the StreetlightSim. Although StreetlightSim is built upon OMNeT++ ver. 4.2.2 and SUMO ver. 0.15.0, the latest version of these tools can also be used. However, slight modifications to StreetlightSim are required. The step by step guide on how to import StreetlightSim into OMNeT++ is available here. Once StreetlightSim is successfully built, now you can try to run some demo scenarios. The step by step guide on how to run the demo scenarios is available here. New streetlight networks can be created using OpenStreetMap, JOSM and customised traffic routes generator. The step by step guide on how to create a new streetlight network is available here.